New from Intertronics comes perhaps the most sophisticated gasketing resin yet – the DYMAX GA-140-SC – a UV/visible light curable Form in Place (FIP) and Cure in Place (CIP) material with the benefit of See-Cure technology which exhibits blue to clear colour change on curing. 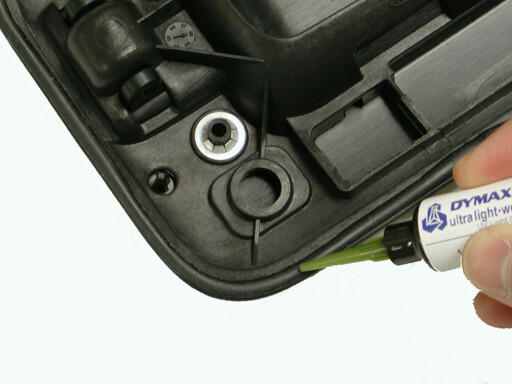 The GA-140-SC is ideal for applications which require soft, tack-free, low outgassing, flexible gaskets for sealing of fuel cells, vehicle door handles, appliance housings, critical electronic assemblies such as LCD frames and for plastic assemblies. GA-140-SC from Intertronics offers many advantages over traditional gasketing materials – it is a silicone free, one part resin that requires no mixing and can be dispensed into intricate and complex configurations – and is ideal for robotic dispensing. Its ability to be cured in line enables increased production speed and throughput, lower processing costs and reduced inventories. Designed for flat flanges, wide shallow grooves or flat surfaces, GA-140-SC can eliminate delays in production while enhancing product quality by virtue of its high performance characteristics, including excellent tear resistance in serviceable and limited service situations. The See-Cure GA-140-SC is suited to nylon and most plastics including ABS, PVC, PC, and PMMA. Formulated with patented See-Cure technology, it is bright blue in an uncured state, enabling automated vision systems and manual operations to confirm placement prior to cure. As the product cures in seconds with sufficient exposure to either UV or visible light, its blue colour transitions to clear and provides obvious visual confirmation that the adhesive is fully cured and the bond site is secure. For further information please see www.intertronics.co.uk or visit their blog at www.adhere.uk.com. The newest DENSO Controller RC8, available from AA Robotics, is 60 per cent smaller than the previous model.